Advances in Infocomm Technology have bridged the gap of physical distance. The promise within the sector to solve pressing problems and enable the advancement of society is undeniable. This sector promises growth and countless opportunities. Contributing to the future of the sector is National Infocomm Scholarship (NIS) recipient Leong Jun Xiang. Jun Xiang is a Security Software Consultant with IBM, a budding heavyweight in the technology sector. The NIS is awarded by the Infocomm Development Authority of Singapore (IDA), an organisation which plays an active role in developing Singapore's pool of globally-competitive infocomm talents. Jun Xiang's role allows him to have a ring-side seat in Singapore's drive to grow our cyber defences. As billions of "events" hit our defences daily, there is an increasing need to guard against both external and internal threats. These threats against Singapore's firms and our government may result in not just financial losses but also theft of identities and commercial secrets. By working on many projects in the public sector, Jun Xiang has been given insight into the work that goes on behind the scenes to secure crucial infrastructure. These infrastructure enable much of our nation's critical services to run seamlessly. He recalls having to scale the steep learning curve as a new employee in a fast-paced environment, sharing, "My time in school focused greatly on enhancing our theoretical knowledge, leaving us to explore the applications with our imaginations. Hence, it was incredibly beneficial for me to be guided by experienced co-workers. My mentors were always eager to give their all for me to learn, which provided me the best start one can have. Also, having encouraging managers and colleagues greatly assisted the transition from being a student to becoming a professional." 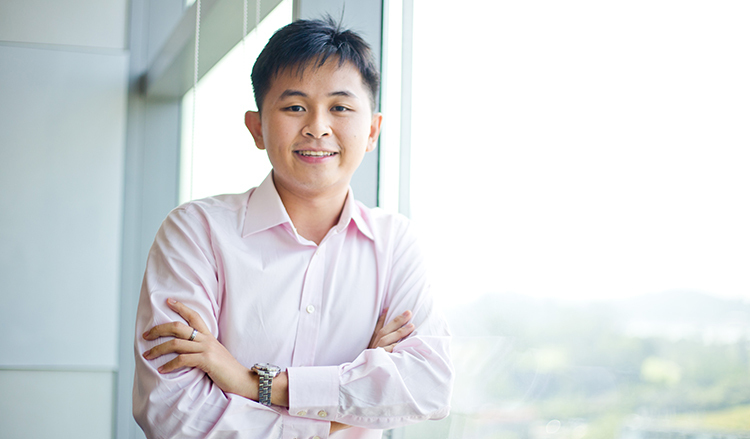 Jun Xiang tells us that innovation is a valuable quality at IBM. In such a vast industry like IT, people are interested to know how you think and recognise the quality of your ideas. Such an environment forces one to think critically and clearly, and these are important qualities to embody in order to stay ahead in the industry. This combination of critical thinking skills and fundamental engineering principles was applied by Jun Xiang in the classroom during his time at Imperial College London, where he pursued his Bachelor of Engineering, and at Columbia University, where he pursued his Master of Science. His sponsored education, which the NIS provided, gave him a strong foundation to perform in his current role. For those whose passions lie in infocomm technology and wish to apply for the NIS, Jun Xiang humbly shares his word of advice, "You need to possess three qualities – passion, drive and determination. There are always more complex projects to handle, more technologies to learn, and more room to grow your skills in the different domains of technology. These three qualities will carry you through your education and guide you on an exciting career." We hear from IE Singapore Scholar Faridah who has travelled to 11 countries and speaks 3 languages for work, and is today the Centre Director at IE Singapore's Johannesburg office!